Our Atlanta driving school teaches you to drive safely with confidence. Basic driver’s education teaches the fundamental skills and knowledge required to obtain a driver’s license in the state of Georgia. 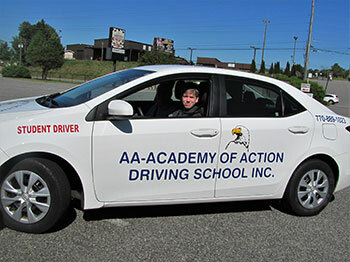 Our Atlanta driving school offers a full line of services to assure you of becoming a safe, confident and responsible driver including practice in one of our dual-controlled vehicles. * Atlanta Driving School Lessons cost $65 / hr. with a minimum of 2 hours of on-road driving instructions. Do you hold a valid license but feel intimidated driving in our area's increasingly busy and congested roads? If you would like to improve your driving confidence and awareness, we offer a driving assessment and basic driving safety instructions. We discuss your own individual driving needs with you and tailor this 2 hour class specifically for you. needs are: night driving, proper lane change procedures, high speed highway driving , highway safe driving practices, driving in hazardous weather conditions, and rural road instructions. At the completion of these driving instructions, you will be among the most confident, safest and responsible drivers on the road. You will be prepared to drive in most traffic or highway conditions and feel confident that you are prepared to adjust and react to any driving situation.